Close associate of PM apparently sought to publish article that Naftali Bennett's father tried to hurt Yitzhak Rabin for Oslo Accords. 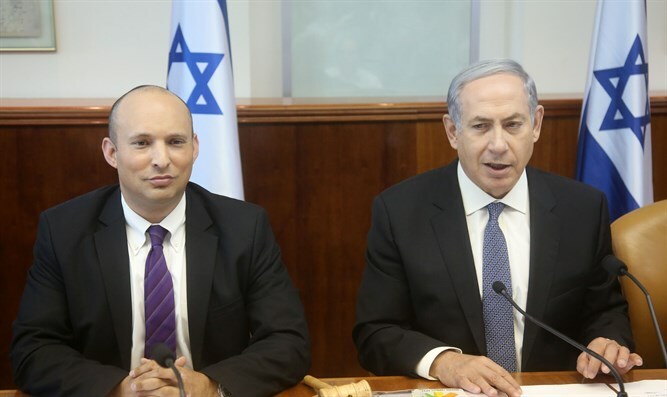 Correspondence exposed this evening on News 12 reveals a plan for Minister Naftali Bennett's political liquidation on the eve of the 2013 elections when polls predicted Bennett 17 or even 18 Knesset seats. Many of the efforts were made by Ze'ev Rubinstein, a close associate of Netanyahu, and by Walla's then owner Shaul Elovitch, and through him by site Director Ilan Yeshua. The means of execution was to be a long series of articles, some of which were supposed to appear to be investigative reports aimed at damaging Bennett's image. Behind the scenes, a close associate of Netanyahu and Elovitch gave instructions to execute every day, sometimes several times a day, sometimes several times an hour. For example, there was correspondence about intentions to publish an article defaming Bennett's wife, Gilat. Elovitch is quoted as writing: "Continued from the friend (Ze'ev Rubinstein): I don't think it's possible to publish: 'The material I gave you this afternoon is very important, especially what they found that Bennett's wife worked as a chef in a non-kosher restaurant (I passed on her picture and there the description of the restaurant and the menu with the shkotzim) and she's a religious woman." A few days later, the message exchange between Walla owners Shaul Elovitch and Director Ilan Yeshua presents an even more problematic picture. Yeshua: "The rest we'll take care of tomorrow. It's extremely sensitive and I don't want to defeat all of us, including them (the Netanyahu couple). We have to do it wisely and gradually or it'll explode in all our faces." Elovitch: "I explained to him (Ze'ev Rubinstein) that it's impossible everything together and that it's dangerous. He understood but he's getting pressure from the pair." Yeshua: "I'll do my best, I'm working on it this moment." Elovitch: "Don't take a risk in any way." Elovitch: "From the friend: 'He's right, everything shouldn't go up at once, but the material I passed on mainly about the restaurant shouldn't be dragged beyond Saturday night.'" Four days until elections and the pressure continued. At 12:30 AM, Elovitch updated Yeshua that there's no choice, that Bibi wouldn't let go of contact-man Rubinstein and suddenly Elovitch's reservations about Gilat Bennett disappeared. Although Elovitch's associates claimed he'd initially opposed Netanyahu's demands, the full correspondence shows Elovitch did initially disagree, but then pushed for the slanderous publication with all his might. Rubinstein allegedly tried to ask Elovitch to besmirch Bennett by blackening his father, with an attempt to argue that Bennett's father had tried to hurt Prime Minister Yitzhak Rabin in the wake of the Oslo Accords, all in response to an interview given by Bennett criticizing Netanyahu's alienation from the national-religious public. Elovitch: "From the friend: 'Check this possibility: In light of the impudent comparison Naftali made between the character assassination committed against Bibi after the Rabin assassination and the alleged attack on the knitted skullcaps and the severe incitement in the press - I propose that you examine the pictures from the demonstration against Rabin at the inauguration of the Kfar Shmaryahu junction. Bennett's father almost physically hurt Rabin, and at the demonstration at Wingate. As far as I know a police file was opened against him, and if he incites against the Prime Minister, perhaps it's worth using the above materials to arouse the secular public regarding the home from which he came.'" A few hours after the email, the directive was changed, "Don't upload this piece," and an explicit order was sent to shred the text. Minister Bennett said in response: "All I have in the world is from my father, the late James Bennett, who was a kind and idealistic person, and my mother, Myrna, who left a comfortable life in the United States and immigrated to Israel out of Zionism. Any attempt to harm my father and family is immoral and must simply cease. "As to the accusation itself: During the Oslo Accords, my father, who was a proud right-wing man, was greatly pained by the handing over of parts of our country to Arafat, and participated in many demonstrations against the move. I admire him for his courage. The other things are a complete lie. Father loved people and would never hurt anyone. I'm very proud of my father and no article will change that."